Bloody silly, but fun. 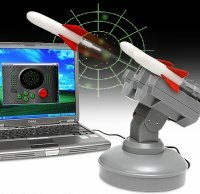 This USB-powered missle launcher comes pre-loaded with three foam missles, which can be hooked up to your PC and fired sequentially when you trigger a virtual version of the red button. Best of all, you can control the direction and angle of the attack with your mouse. The launcher will rotate and tilt while you zero in on your unsuspecting victim. It may not cause much collateral damage (what do you expect from a US$50 weapon of mass distraction? ), but the entertainment value is highly satisfying. Watch a video of how it works here. What do you give the iPod owner who has everything?